The SentrySafe SFW123DSB is quite simply one of the best value combination safes available. This small combination safe offers security and design features usually found in much more expensive models. Designed to be water and heat resistant as well as extremely difficult to break open, it is a total solution for any domestic or business purpose. Secured with a mechanical combination lock and four one inch bolts makes this one of the best gun safe on the market. Depending on their needs owners can also choose to bolt the safe to the floor or keep it portable. 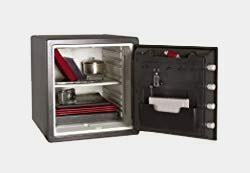 No matter what is stored within the SentrySafe SFW123DSB finding a better combination safe at this price point will be very difficult indeed. 3.4 Portable Or Bolted Down? The Owner Is In Charge. A classic combination safe that is reliable and ever-ready. 60% larger bolts that are standard for this size of safe. ETL approved fire and water resistance accurate to levels advertised. Flexible storage space that is perfect for storing all valuables. Seamless design that is secure as well as very stylish. Measures in at 19.3 x 16.3 x 17.8 inches with an approximate weight of 100 lbs. Smart gray color. Includes Manufacturer’s limited warranty and the peace of mind of being a SentrySafe product. This SentrySafe ‘fire safe’ is perfect for those needing absolute protection against fire or water damage. People looking for a familiar and dependable combination safe. It can be used to store documents, valuables, firearms and has a door mounted sleeve perfect for data storage devices. This makes it a very comprehensive safe suitable for any needs. Weight makes it tough to carry for any distance. A great option for small business owners to store cash and receipts. Would work well mounted on a truck. Perfect for contractors needing an on-site security solution. Many safes in this price range are not heat or water resistant. The SentrySafe SFW123DSB has been thoroughly tested to offer solid protection in the event of fire or submersion. During independent testing, this combination safe performed very well. Depending upon proximity to the core of the fire, the SentrySafe fire safe is expected to protect contents from damage for around an hour of exposure. Underwater the safe ought to remain sealed for at least eight hours, likely much longer depending upon depth and pressure. This is based on an eight-inch depth which equates to near total submersion. Usually, this level of protection is only seen in much more expensive safes. 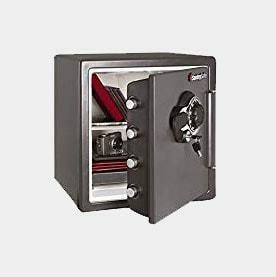 This is a classic safe designed with absolute security in mind. Four one inch bolts are used to lock the safe which has been constructed to be extremely durable. Unlocked by both key and combination, there’s no better form of classic and dependable peace of mind. The seamless design would make it very difficult to break into. One of the best features of the SentrySafe SFW123DSB is that there are no easily exposed pressure points. The door slot absolutely perfectly into the unit and getting past the four bolt security would take lots of time and noisy equipment. Luckily these are two things that the average criminal will not have on hand. While this product falls into the ‘small combination safe’ category, it can still hold plenty of valuables. It is deceptively spacious inside, and the enclosed shelving can be positioned as the owner requires. This is a very useful feature as it makes this safe ideal for storing any kind or number of items. Included inside the safe are a door mounted tray and sleeve pocket to help with easy organization – a feature which would be very useful for business owners to keep records of their takings. Pistol owners will find that there’s easily room for the three or four weapons including holsters and ammunition. So no matter what needs to be secured the SentrySafe SFW123DSB can easily match the task. Portable Or Bolted Down? The Owner Is In Charge. One of the few negatives of the SentrySafe SFW123DSB is that it does not come with pre-drilled holes for securing the safe to the floor. Performing this task only takes a few minutes, and instructions are easily available for anyone needing to do so. However, in no way does this detract from the fact that this is a combination safe that puts the owner firmly in charge. No everyone needs to secure the safe to floor or furniture as many people use this safe to transport valuables on a daily basis. Remember also that empty this safe weighs over 100 pounds. Any thief without transit is going to struggle to carry it far especially as there are no grips or handles. It is interesting times in the world of home and business security. Biometric safes have been gaining an ever larger part of the market, yet sometimes a dependable combination lock is simply more practical. SentrySafe has been around for over 80 years and have one of the best reputations of any manufacturer in the world. 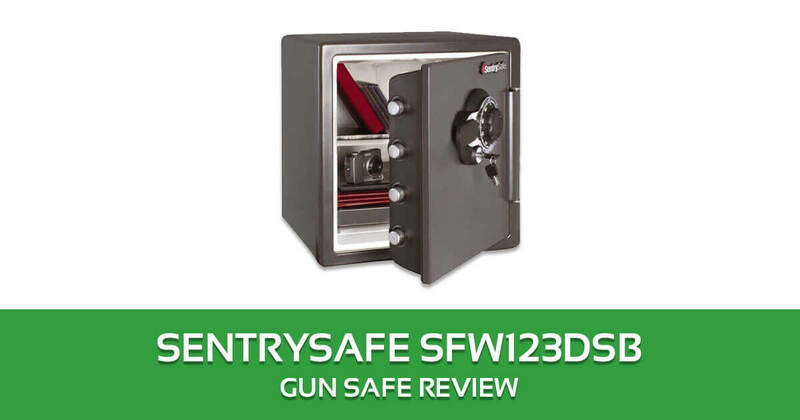 In regards to the SentrySafe SFW123DSB, they enclose a very generous warranty scheme with like for like replacement should the safe fail or be unduly compromised. Of course, this is very unlikely as they put their products through industry leading tests. This combination safe was tested at being dropped free-fall from fifteen feet onto a hard surface. It survived with barely a dent, still unlocked fine and with no damage to the valuables whatsoever. Second to none for sheer value. Many more expensive safes are inferior to this model. Excellent fire and water resistance. Independently tested and verified byEdison Testing Laboratories. A ‘Jack of all trades’ safe that will store and protect anything that is contained within it. Perfect for looking after documents, cash, valuables, weapons – you name it. Extremely difficult to break into thanks to superb engineering and very tough steel. Batteries can be replaced externally when required. The lack of floor mounting attachments may be inconvenient in some cases. However, this is easily remedied. It is advisable to open the safe every couple of weeks to allow it to ‘air’. This safe is so secure that condensation can build up otherwise. Storing documents and cash in zip bags eliminates this problem. Do I need the key to access the safe at all times? Yes and remember that the key is not an override to the combination. Take care to memorize the combination upon taking delivery of the safe. The code cannot be customized. Could the SentrySafe SFW123DSBbe wall mounted? Theoretically yes but remember that this is literally a heavy duty safe. It will require very strong brackets. Are the interior walls also metallic? No, they are plastic. The safe has a steel exterior followed by a layer of fire resistant material sandwiched between the soft plastic interior walls. This is common in most modern safes. It is very difficult not to like the SentrySafe SFW123DSB. Not only does it offer complete protection for your valuables, but it’s also very good value. Thoroughly and independently tested to be a complete security solution, it’s refreshing to find a product that stands up to the reputation of its manufacturers. Reliability is the stand out feature. There is no reason why this safe could not last a lifetime of regular use. Not only is it extremely well designed and finished, but it is also practical for any purpose. For some people, it would work superbly as a daily use business safe. For others, it’s a gem for securing firearms and valuables against the threat of home invasion. All round it’s one of the very best combination safes available and has to be very highly recommended indeed.